Qigong Meditation is a special category within meditation. Qigong meditation is not only relaxing but it also enhances healing by increasing Qi flow within the body. Qigong literally means Qi or energy cultivation. Qigong meditation combines relaxation with mental focus to lead the Qi for specific goals that are unique to each particular meditation. There is a complete online recorded Qigong meditation program through the Qi Gong Institute of Rochester offered as individual volumes (1-5) that can be taken in any order. Click on the course titles below for the exact listing of meditations covered. Also, many of the Qigong exercise courses taught here include various meditations that pertain to that exercise program. 10 half-hour meditation sessions recordings. Cultivate your energy to very high levels with these meditations. Meditations in this session: Circulate Universal Qi, Mindfulness (Thich Nhat Hanh Poem), Four Tones, Dantian (Roots and Sun), Qi Cleansing Breath, Yin Essence, Sky Door Breathing meditations. Only $55 if taking another course! 10 half-hour meditation sessions recordings. Cultivate your energy to very high levels with these meditations. Meditations in this session: Lotus Blossom Meditation, Body Scan Release Meditation, Qi Exchange with the Environment or a Partner, Belt Vessel Meditation, Free Form (Spontaneous Qigong) Meditation, Bone Health Meditation. Only $55 if taking another course! 5 half-hour meditation lessons recordings. Cultivate your energy to very high levels with these meditations. Meditations in this recorded session: Whole Body Breathing Meditation, Healing Journey Meditation, Inner Smile Meditation, Enlightenment (Upper and Lower Dantian) Meditation. Only $30 if taking another course! 5 half-hour meditation lessons recordings. Cultivate your energy to very high levels with these meditations. Meditations in this recorded session: OM Meditation, Microcosmic Orbit Meditation, Boundary Meditation, Diamond Lotus Meditation, Balance Five Elements Meditation. Only $30 if taking another course! 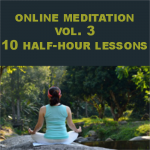 All 40 half-hour meditation sessions recordings package! Over 40% off! The entire Qi Gong Institute of Rochester Meditation Program in one bundle.